Little Bit Funky: reuben hotdogs. best of two worlds. reuben hotdogs. best of two worlds. We first made these for Father's Day this year, then proceeded to think about them every day since then until we finally got to make them again this past weekend. And I remembered to take a photo before they were devoured! 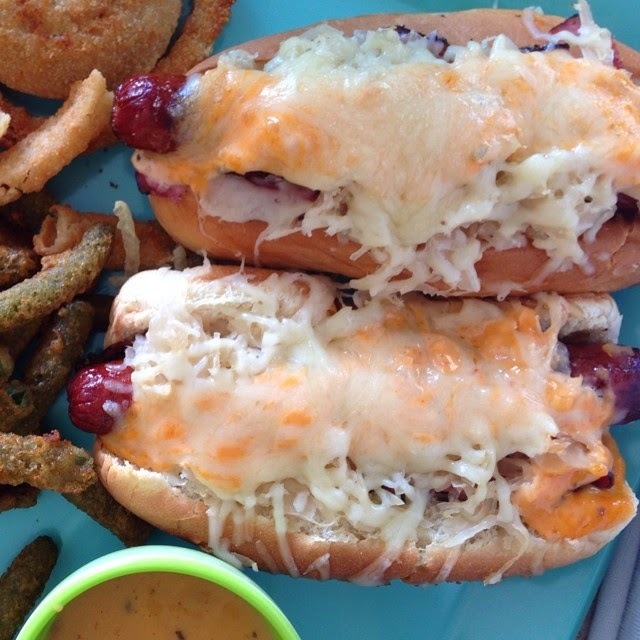 If you like Reubens and grilled hot dogs, then this is the meal for YOU! As you can imagine, they are relatively easy to make. Start by grilling your hot dogs (we love Nathan's or Hebrew National). While they are grilling, on a lined cookie sheet, open up your hot dog rolls and line them in sliced pastrami, once your dogs are ready, put them in the rolls, top with sauerkraut, thousand island dressing and top with swiss cheese (shredded or sliced). Throw them under the broiler in the over until the cheese is good and melty. That's it. The best part about these is that the two flavors shine! They are SO good.